The television show “Designing Women” had a seven-year run, but Sun City’s Consigning Women has that beat. The consignment store, 10712 W. Bell Road, has been in business — in the same location — for 10 years. Owner Cathy Parker and her staff will celebrate the milestone Saturday, April 6 with an open house. 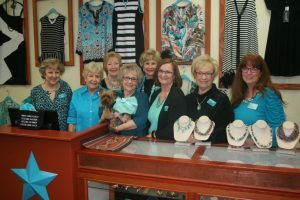 Consigning Women staff, from left, Shirley Flaim, Manager, Betty Woolford, Cathy Parker, Owner, Abbe the Yorkie, CEO, Robin Yuenger, Connie Morley, Paula Natarelli, back row, Nancy Donielson and Sharon Wordd. With 10 years under her belt at the location just off Bell Road, the busiest roadway in Maricopa County, Ms. Parker has no immediate plans to close of shop. She added she will go as long as she feels good. Ms. Parker had a consignment shop in Indianapolis for eight years before coming to Arizona. She added she fell in love with the concept after she visited a “toggery” (informal clothing) store in Indianapolis. Consigning Women has done well over the years. About 95 percent of the clothing in the store is consignment, according to Ms. Parker. The items have a high turnover, with an average of about 100 items coming in daily and a similar amount going out. 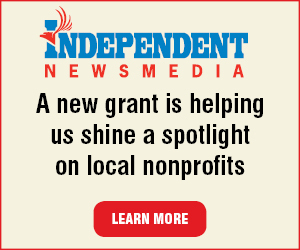 “We have an inventory turnover rate about 88-92 percent,’ Ms. Parker said. The items that are not consignment come from estate sales, from which she sometimes does a buyout. She said the store has so much inventory there has to be a sale every month. “No matter where a person lives, they are most always looking for a bargain,” Ms. Parker said. Through Feb. 12, Consigning Women had 5,281 consigners since the store’s April 6, 2009 opening, with 200,439 items broght in for resale. But Ms. Parker cautions new customers against viewing her store as a second-hand or thrift store. She is picky about what comes in for consignment. She has set guidelines for consignments, including limits on how old clothing can be, they must be clean and on hangers and a set list of brands accepted. The store also sells shoes, purses and jewelry that all must be “like new” to be accepted. Consignments are also only taken by appointment. “I have appointments backed up to May,” Ms. Parker said. She is accredited in home staging and enjoys doing displays in her store. She also enjoys putting together ensembles of outfits for customers. “I had at one time looked for a larger area for the store, but customers said I would lose the atmosphere they liked so much,” Ms. Parker said. Prior to the April 6 open house, customers will have a chance to win a $300 gift certificate. They will get a raffle ticket each time they shop.